2017 Vans Pro Junior winner Mateus Herdy (BRA) (L) and Vans Pro QS3,000 winner Keanu Asing (HAW) (R) claimed huge victories at 1st Street Jetty and took back the title from North American contingent. 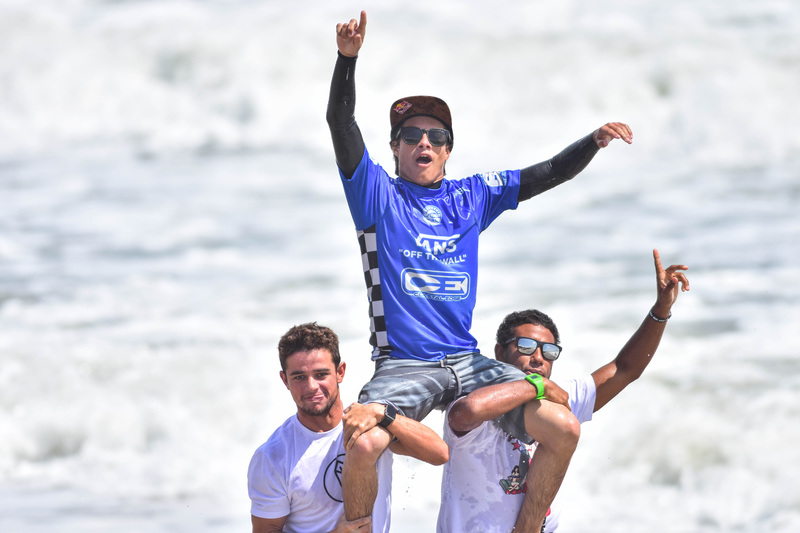 VIRGINIA BEACH, Virginia/ USA (Sunday, August 27, 2017) – Keanu Asing (HAW) and Mateus Herdy (BRA) claimed massive wins in Virginia Beach at the World Surf League (WSL) Vans Pro Qualifying Series (QS) 3,000 and Pro Junior. The iconic 1st Street Jetty received a kick in swell overnight and two-to-three foot windswell pulsed throughout the day to deliver fun conditions for finals day. Both Asing and Herdy dealt with the varying Virginia Beach conditions during the event window and emerged victorious with Asing earning an all-important 3,000 points. This marks Keanu Asing’s (HAW) second QS3,000 win this year and another big chair-up in 2017. 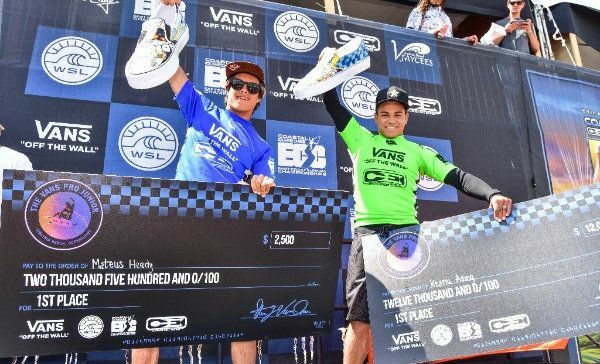 The Vans Pro QS3,000 saved the best for last as Asing battled with three former Vans Pro champions including Evan Geiselman (USA), former Championship Tour (CT) competitor Patrick Gudauskas (USA), and current CT. surfer Kanoa Igarashi (USA). This marks Asing and Guduaskas’ second Final together at Virginia Beach when Gudauskas took the victory in 2013, but Asing’s incredible start to the Final left his competitors in a combination situation, meaning they needed two new scores to total Asing’s, right out of the gates. Asing posted a 7.33 (out of a possible 10) and backed it up with a near-perfect 9.00 just minutes later to start his Final campaign. The 24-year-old’s lethal backhand seared through the 1st Street Jetty lineup with a power that went unmatched in the Final to earn his first-ever Vans Pro QS victory — and the first to claim a WSL Pro Junior and QS win at Virginia Beach. Asing’s formidable backhand continues to win him events after winning at the lefthand reefbreak in Barbados. This win puts Asing back into the Top 10 on the QS rankings and plenty of momentum heading into Europe. The South Shore, Oahu, native made his intentions clear at the beginning of the year and now has two QS3,000 wins to back them up. Patrick Gudauskas (USA) went all or nothing — unfortunately not coming down with the landing to this massive air in the Final. This marks runner-up Gudauskas’ third Vans Pro Final, earning a win in 2013 and third-place finish last year. 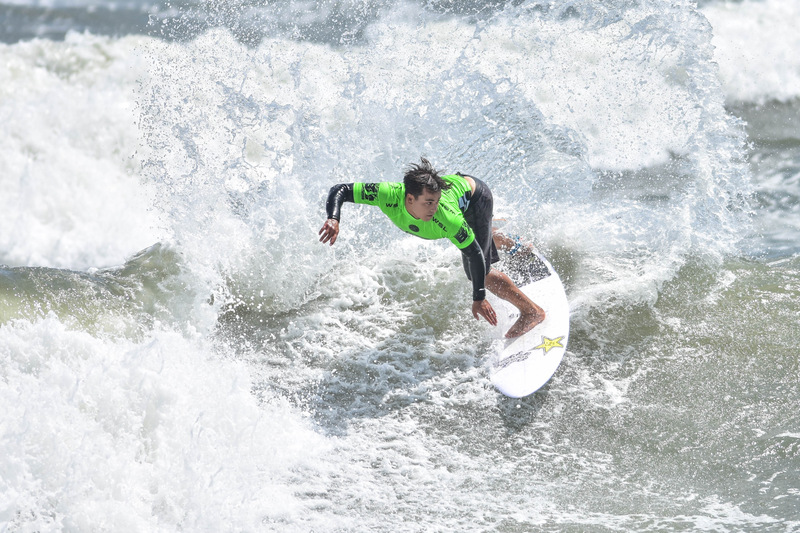 The San Clemente, California, surfer looked to be on his way to a second Vans Pro victory with the contest’s most stunning performance in Semifinal action — earning a Perfect 10 and 18.90 heat total to mark the event’s highest single-wave score and heat total. Gudauskas’ immaculate air-rotation had the crowd in an uproar as he added two more carving turns to finish off the wave at the shoreline. Now, the 32-year-old prepares for an all-important European leg to find his way back to the Dream Tour by season’s end. Mateus Herdy (BRA) is back on top after some amazing performances and with the help of his Brazilian support crew in Virginia Beach. Vans Pro Junior winner Mateus Herdy (BRA) created a stir on both the QS and Pro Junior levels this week, making it all the way to the Quarterfinals of the QS3,000 before dominating the junior event. Herdy’s task was no easy one with the likes of event standout Joh Azuchi (JPN) battling the Brazilian wave-for-wave as Yuji Mori (JPN) and Tyler Gunter (USA) were left in combination situations just to get runner-up. 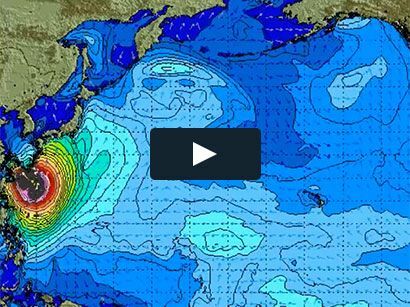 The 16-year-old Brazilian, alongside Mori, crushed the hopes of current North America No. 1 Ryland Rubens (USA) and No. 2 Che Allan (BRB) of earning vital points toward World Junior Championships wit his vicious forehand in the Semifinals. 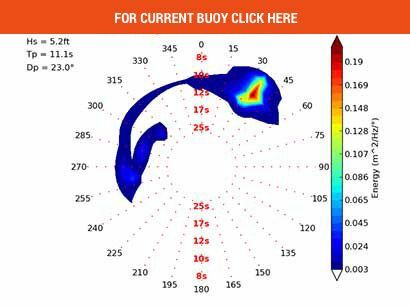 But, Herdy saved his day’s best for the Final and earned an excellent 8.50 on a critical forehand layback toward a crucial exchange with Azuchi — who earned a near-perfect 9.40 on his previous wave with a gauging forehand wrap and finish snaps. Herdy regained the lead, and would not lose it again when the final horn sounded, and earned his second Pro Junior win of 2017. Herdy’s air-game was his strong suit this week, but found himself moments of searing rail gauges — helping him win the Final. Despite Rubens’ Semifinal exit, along with Allan not dropping any spots, he still remains the current No. 1 and inched even closer to solidifying himself in the Top 4 for a chance at his first-ever World Junior Championships appearance. Joh Azuchi (JPN) completed the internationals dominance with a runner-up performance. Azuchi eliminated North America contenders Taro Watanabe (USA) and Jacob Burke (BRB) in his Semifinal alongside Gunter. The Japanese talent already has experience at the World Junior Championships, where he lost to eventual champion Ethan Ewing (AUS) in Round 3, and continues to learn more with each passing event. But, Azuchi showed he’s one to watch after his performance here — dropping numerous excellent scores throughout the event and near-perfection in the Final. 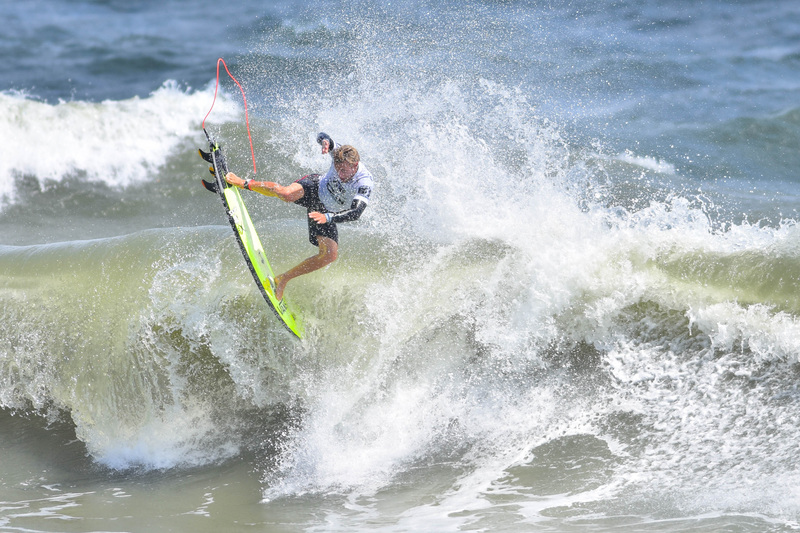 The next North America Qualifying Series event will be the WRV Outer Banks Pro QS1,000 presented by Pacifico beginning August 30 through September 3 at Jeannette’s Pier, Nags Head, North Carolina. The North America Pro Junior Tour returns to action September 22 through 24 for the RVCA Pro Junior at Newport Beach, California.